LOOSE AND LEAFY in DORSET: FROM SMALL SYCAMORE SEEDS . . .
FROM SMALL SYCAMORE SEEDS . . .
Not a lot of change at the tree. The lesser celandines between its toes have been nibbled to their stalks. At the foot of the bank, the dip is dry. When rain comes it will be soggy. Sometimes it's a sluggish small stream. The patches of green down there are celandine leaves - not enough to impress though. 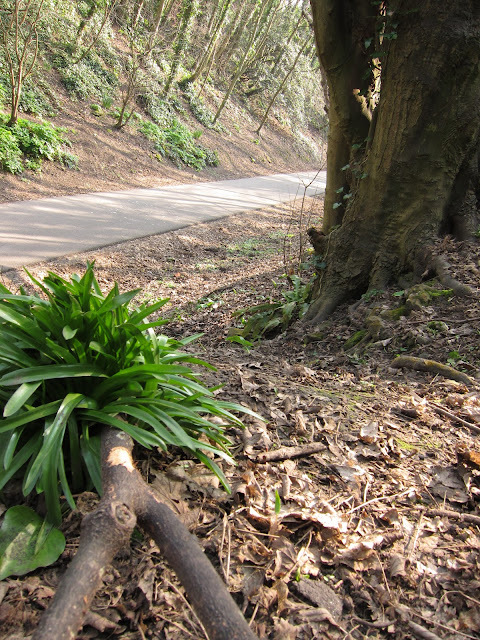 Meanwhile, the bluebells on the left of the picture (hope they are bluebells! - time will tell) are bulking up. February 9th 2011 - in colour! The sky has changed. Not all the time - but when I took the latest pictures (8th March 2011) it was blue. At my feet, a clump of moss; a marker so I know where to stand next time. 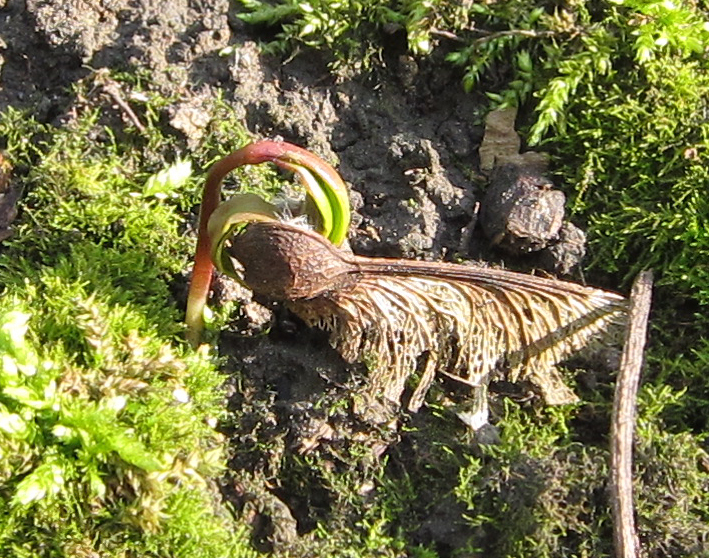 And on the moss, a sycamore seed. Already it has a root boring into the earth. With this anchored, it begins to wrench its head from the wing. The parent trees remain leafless while their offspring need light for first shoots. They look like Bluebells to me, too. Hope they're not of the Spanish variety, however! Love the seedling. Tiny, of course. This looks like rather a special place. Love the picture of the Sycamore seed. It looks like a butterfly emerging from its chysalis! Hello Mag - we'll see what kind of bluebells they are when they flower. I tend to think Spanish ones are inevitable now - though I don't know quite how they would have got up there. The seedling is tiny in relation to us - but as seeds go, sycamore ones are quite chunky. The place itself is, I agree, very special - but is also very public and easily accessible - you can see from the path below. Hello Mark - I'm rather hoping the seedling will still be there when I go back. It may be a tall hope for a small seedling but it's not an impossibility. That last photo of the seed is very nice! I also like the two photos comparing February and March light. Hello Dreamfalcon. This view alone - looking up into the tree - will go through lots of changes as the seasons go by. WOW! I love the pictures of the seed. Though it is so tiny, it is such a powerful moment when the seed breaks through it's hard shell and puts down that first radicle. Mag - I tried to leave a note about your peafowl on your blog (about pheasants, ravens and collar doves) but it wouldn't 'take' and now, despite several tries, I can't get the post to load at all. I expect it will be ok later but decided to put a note here just in case. Dear Lucy - this is a charming project and is teaching me to view my sycamores with less of a jaundiced eye. Your images are very impressive and convey a lot of love. Hi Lucy, I decided to see what you see when you look at nature! I love this post about the sycamore tree. From the seed, I think perhaps it is related to what we in the USA call maple trees. 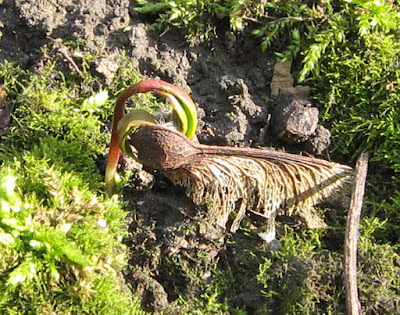 I hope when you return you find a healthy seedling growing in the moss!